With this beautiful Solemnity of Christ the King, we bring our liturgical year to a close. 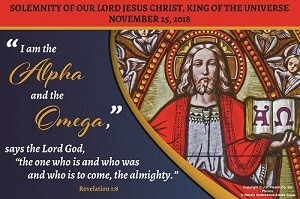 We honor our Lord Jesus Christ, King of the Universe. However, Christ’s kingdom “is not of this world.” Jesus does not call himself a “Jewish King”. His kingship is broader than over one nation, and what is subject to him is much larger than Pilate’s imagination. We do stumble over the notion of Christ as King today. The view of monarchies we can see is not very inspiring. And as Americans, our history has been away from kings and queens and their pseudo-divine rights. But, Jesus Christ puts kingship in its proper place. Sovereignty, complete power over all, is in the possession of the Lord of Love. Indeed, his kingdom is “an eternal and universal kingdom, a kingdom of truth and life, a kingdom of holiness and grace, a kingdom of justice, love and peace.” (Preface of Christ the King of the Universe). The beautiful Season of Advent begins next Sunday! A whole brand new Church year! Undoubtedly, all of us will be involved in all the busyness of Christmas shopping, decorating and office parties. While these events help to bring in the Christmas spirit, our liturgy helps us understand that the best way to prepare for Christ’s coming is by interior preparation of our hearts. That means prayer, reflection and giving of ourselves and our resources to those most in need. I invite all of us to take part once again in our “Angel Giving Tree”. Please take an ornament off of the giving tree and bring back to church the gift that is listed. This year, our focus is on needy children of our area and beyond! This would be an excellent way for families to bring their children along to select gifts for other children! Thank you for helping to make Christmas a little brighter for others. Another important way to prepare for Christmas is the Sacrament of Reconciliation. When was the last time you made a good Confession? God loves the world enough to send Jesus, the only begotten Son, for our salvation. God created us in love and continues to love us always. Whenever we sin, God does not simply wait for us to repent. God anxiously seeks us out, yearning for our friendship, longing to forgive. As Pope Francis says: “How good it feels to come back to God again whenever we are lost! Let me say it once more: God never tires of forgiving us; we are the ones who tire of seeking his mercy…time and time again, he bears us on his shoulders…(He) makes it possible for us to lift up our heads and to start anew.” (The Joy of the Gospel, No. 3) Please join our parish family on December 13th for the celebration of God’s mercy in the Sacrament of Reconciliation Liturgy. Please see page #5 for more details. In closing, I wish to extend our entire parish congratulations and blessings upon our brothers and sisters who will participate in the Rite of Acceptance and Welcome next weekend! Through this beautiful rite, catechumens and candidates from other Christian faiths, are welcomed into our Catholic community. From this time on, the Church “embraces the catechumens to be baptized and candidates seeking a Profession of Faith in the Catholic Church, with a mother’s love and concern. Now, they will eagerly move forward through prayer, study and the various Rites of the Church toward the Easter sacraments! Please welcome and pray for our brothers and sisters as they continue this journey of faith!